Nostalgia is a funny thing. One of the scariest parts of growing up is looking back and noticing the constant presence of change, both good and bad. Many college and high school students find themselves analyzing what was, longing for their favorite Saturday morning cartoon, a discontinued soda, or a retro commercial for a much-loved toy. Conveniently, people usually block out (maybe purposely, maybe not) the not-so beloved parts of their childhood— namely, the part where kids are horrible to each other. 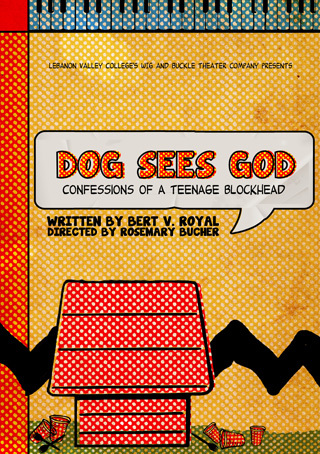 Bert V. Royal's Dog Sees God: Confessions of a Teenage Blockhead revisits both the good and bad parts of growing up. We're reunited with the Peanuts gang (in a copyright-compliant fashion, of course), only to find that they aren't quite as sweet as we remember. That's putting it lightly, but it's still painful to recognize that even our favorite comic characters grow up and become assholes. Our nostalgia is used to manipulate our emotions, and that's downright unsettling. There's some very sensitive material here. The characters are vulgar and horrible to each other, but they talk the way real teenagers talk. It's a witty blend of realistic dialogue and tropes from every high school movie you've ever seen. The words they're saying are offensive, but their misunderstanding of culture and failure to express maturity plays into the overall message. We are not excusing this behavior by performing it, but demonstrating that it has consequences. The show is a parody, black comedy at its best, but it's very much rooted in reality. The situations encountered by CB and the gang are social issues that are very relevant in today's society. We want to make you think while you laugh and cry. I've long admired Charles M. Schulz, the creator of Peanuts. His understated wisdom is spoken through his characters, who have shared their innocence and heartbreak with the world for more than 60 years. Schulz's life is a dramatic and humorous story in itself, hidden through 50 years worth of inked-in lines and halftone dots. If you look closely at his life's work, you can see Schulz himself in Peanuts. Similarly, Dog Sees God has been a true creative collaboration, demonstrating all that Wig and Buckle stands for. So many students were involved in this production, showing their artistic and technical talents through performance, leadership, and creativity. If we've done our job correctly (and I believe we have), you can see a little bit of everyone who has been involved with this production. I'd like to thank the technical crew and artistic team, especially Dee and Taylor, for making a beautiful and visually striking setting for this story. 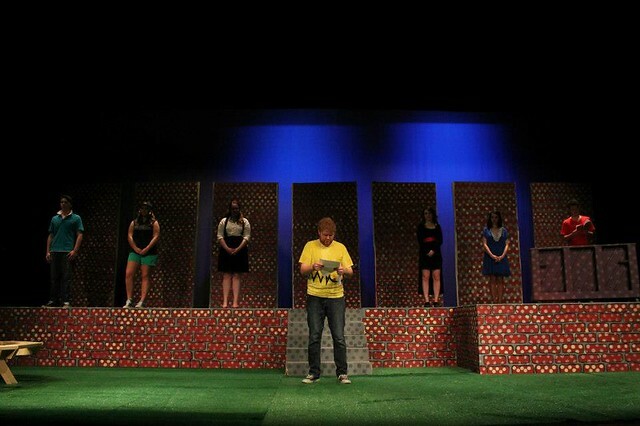 The actors performing tonight have had a long journey. They've worked hard to separate themselves from their characters, and even harder to respect Schulz's original comic strip while developing their own. We've taken great care in maintaining Schulz's characterizations while establishing Royal's story and dialogue. Our aim is to entertain you by teasing you with your nostalgia, because there's a reason these characters were chosen to tell this story—to make you think. Schulz once said, "If I were given the opportunity to present a gift to the next generation, it would be the ability for each individual to laugh at himself." Royal has cleverly assisted Schulz in sharing this gift by making us reexamine the way we think about life and death, particularly the way we treat each other. Thank you to the cast and crew for your talent and dedication, but most of all, I'd like to thank you, our lovely audience, for supporting what we do in Wig and Buckle. We hope to see you next season. Enjoy the show in all its spork-raising, hair-burning, blanket-smoking glory!